Marge was a longtime Galva High School art teacher, former president of the Illinois Art Education Association and now, a retired teacher. She started the council to support and encourage artists in her small community, and quickly found success thanks to the community’s support. The council purchased a building, operated on fundraising, and Marge eventually saw the need for a permanent home for the council’s funds. “It was operating beautifully, and I wanted to ensure that it could do that forever,” she said. That’s when the Galesburg Community Foundation came into her life. President and CEO Joshua Gibb invited her to an informal presentation on funding for nonprofits. 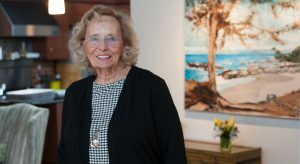 It was just what she needed to hear, and she set up the Galva Arts Council Endowment Fund soon after. “The Community Foundation is so efficient. You have questions and they know the answers. You may not know what you’re doing, but they do,” she said. One of the greatest joys of our work is partnering with people like Marge to help them give back to their community. Let’s talk about how we can help you spread your generosity in the community you love. If you have a dream for your hometown, we’re here to help you do that easily through your giving. Contact us at JGibb@YourGCF.org today, or give us a call at 309.344.8898.